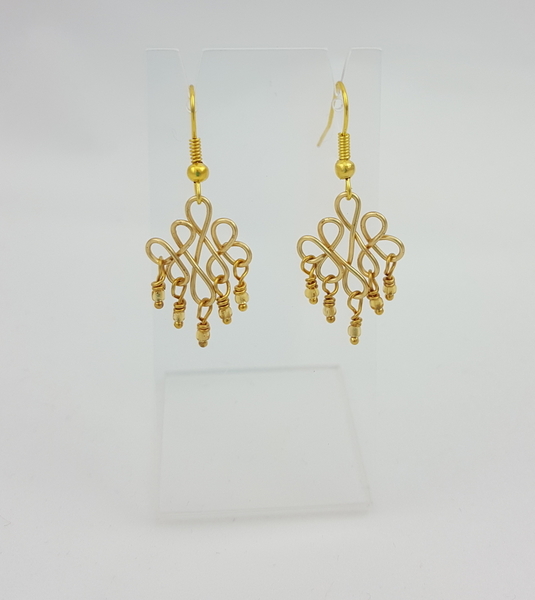 These distinguished brass earrings are designed and hand crafted by young women who have begun a new and safe life having escaped the horrors of human trafficking. This business offers women the chance to live and work with dignity and security. In addition to imparting life skills, this business is also providing long term support, child care and safety. Your purchase of these earrings enables you the privilege of being a part of their story and journey to freedom. Each features the traditional Mongolian Eternal Knot (bearing a blessing for long life) embellished with a spray of tiny dangling glass beads. The total length of the drop is 2.5 cm.